Spread on the slices of bread, or slice the baguette diagonally and spread in between the slices. Lay the slices on a baking tray, or if you have a baguette, wrap it in foil. Bake in the oven for 10 minutes for the slices, or 20 minutes for the baguette, opening the foil a little half way through. If you want to make it with cheese as well, add a few slices of mozzarella or cheddar on top of the slices. 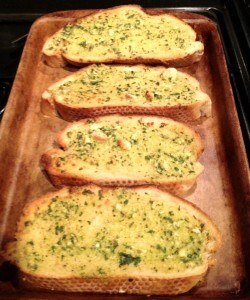 With a baguette, cut into small cubes and mix with the butter and herb mixture and spoon in between the slices at step 3. Why not try mixing different herbs? I like parsley and basil. If you haven’t got them fresh, dried will do.